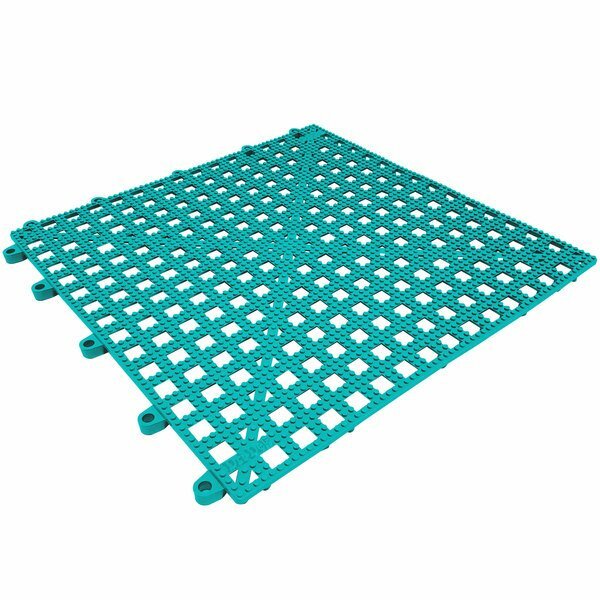 This Cactus Mat 2554-TLT Dri-Dek 12" x 12" teal interlocking drainage floor tile provides excellent slip-resistance against wet floors in showers, saunas, pools and spas, locker rooms, and other wet areas! Its flow-through design drains water fast to prevent standing water from accumulating and reduce slippage risks. Plus, the vinyl material contains Oxy-B1 for mold, mildew, and bacteria protection. This interlocking, snap-together tile can be easily cut to size to fit any area and around any obstacle! It smoothly connects to other tiles as well, as the beveled edge and corner pieces effortlessly fit together. So you can create a safe custom floor surface that helps meet OSHA regulations!